As a young and dynamic real estate agency 7C Realtors comprises of synergized and skilled real estate professionals. With a modest start in 2000, it now has around 1000 satisfied clients. 7C Realtors, based in Delhi and NCR is associated with developers like Earth Infrastructure,Cosmic,RED mall,World Trade centre,Premia, Ajnara Group,Amarpali, Civitech, Wave Infratech etc in connection with underwriting for these companies. The company provides a number of real estate solutions to various requirements like investment consulting, sale/purchase and leasing to branded companies in malls and showroom space in commercial markets Our commitment is to enhance the business of our clients by providing these services fulfilling their real estate requirements. We have a methodical approach involving a number of steps to understand our clients, like exposure, return of investment, time outlook and risk appetite. Based on these criteria we come up real estate solutions for our clients, who are corporate as well as individual customers. At 7C Realtors, we believe in complete customer satisfaction. 7C Realtors has always made an effort to make sure that its customers get homes suiting their tastes and lifestyles and budget. We strive to make sure that with every deal puts our customers as well as business partners in an advantageous position, by establishing a profitable relationship between the two. Our mission is to provide quality real estate and allied services and help our customers get their dream home or ideal investment as quickly as possible. An in-depth study of our clients and a methodical approach enables us to give customized and end user specific solution. Our mission is to provide the perfect opportunity for the investor for optimizing his returns. At 7C Realtors, we not just say that customer is the king, but we believe in it and work around it. In addition to that giving equal importance to post sales follow up and service as pre sales is another of our cherished values. We also value and realise the importance of transparency in every deal. Last but not the least; we know the value of being a responsible corporate entity. 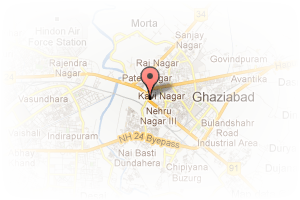 Address: sec-4, Vaishali, Ghaziabad, Uttar Pradesh, India. 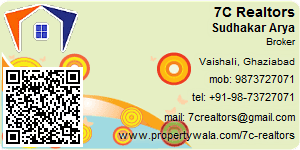 This Broker Profile page for "7C Realtors" has been created by PropertyWala.com. "7C Realtors" is not endorsed by or affiliated with PropertyWala.com. For questions regarding Broker Profiles on PropertyWala.com please contact us.